Walsall Council has advertised a Traffic Order to extend the double yellow lines on the exit onto the Lichfield Road from The Square. There’s a copy below. The Council’s action follows a request from Cllr Ian Shires and the Willenhall North Lib Dem Focus Team for officers to look at road safety at the exit from The Square having had many complaints from motorists about the dangers of joining traffic on the Lichfield Rd with cars parked close to the junction. 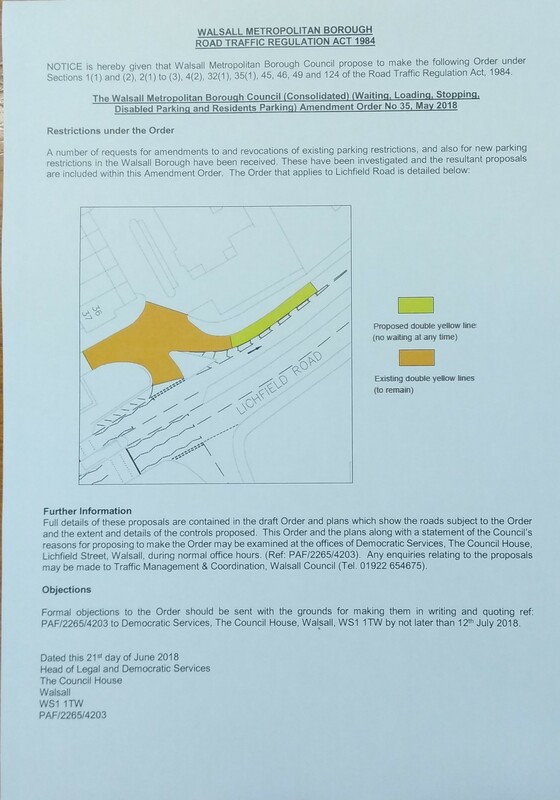 Have a read of the order, the diagram shows what is being proposed. There are some contact numbers if you want further information and the consultation ends on 12th July 2018.